This month's full moon is known as the seed moon or pink moon. For some reason, I've been struck by the glory of a moon dressed all in pink. See it gets the name pink from the ground phlox that blooms this time of year. And this is one of my absolute favorite times of year to photograph. I love gardens in spring. I grew up playing among the azaleas, Andromeda, bluebells and daffodils. I love the way the earth smells when she's laughing in flowers. Persephone does leave a glorious and fragrant wake as she returns from Hades. There is nothing like the delicious smell of blooming azaleas, Andromeda and clematis all mingling with rhododendron an the warmth of a sunny spring day or lingering upon every dew drop following a gentle spring rain. The images you see before you are a several photographs I took in one of my favorite gardens. If you play in the garden, you'll find magic & faeries among the bright blossoms & rich evergreens or deep underneath the cascading blossoms of the Andromeda bush. What I find fascinating is how different the scents are from each of these flowers. The clematis really smell like chocolate. The andromeda like a heavy, syrupy honey, and the azaleas are sweet and bright, like a sibling to the summer trumpet vine or the springtime honeysuckle found enveloping every early spring night in Kansas City, Missouri as the days heat wanes and the earth sleeps. I would love to travel the world as spring comes alive in every place just to experience the scents. What would it be like to be right smack in the desert when all those cactai burst open? Or how about standing in a Moroccan garden among the roses? Or sipping your morning espresso beneath an arbor crafted of gardenia? It'd be quite a glorious hedge. What other amazing scents could you discover? If only to bottle these and wear them. I would definitely wear scents of Azalea, Andromeda, or Honeysuckle. Wow, glancing over this post, I love how colorful it is. And, I realized how truely me it is! I love it! Color is a wonderful thing. I lived in a land of grey once and now choose to live in technicolor how ever I possibly can. Back to the moon. When I began sculpting, I didn't intend her for the Alter project. After last month, I decided I'd just play a little and if it worked out, great. If not, then I'd have a fun art piece and I would have taught myself to sculpt a face in paper clay. I've done quite a bit of sculpting with pottery clay, sculpey and fimo, but paper clay seemed too soft. With inspiration and courage found from classes with Michael DeMeng, Clarissa Callisen, Patricia Hedegaard and the Halloween book by Mr. Glitterville, I embarked upon the journey. Well, it was a bit soft. But, I just kept playing and out came this magical moon face. Then, instead of keeping her just a full moon, I decided that I wanted her to represent both the full and the crescent moon. She could be waxing or waning, depending on which side you observe her. I gave her a long pointy nose and a very pointy up-tipped chin. I tried the pressed in eyes like shown in Glitterville, except with mine, I added them with flattened circles of of clay and created eye sockets, just in case I wanted to add a glass eye. Then, after bone dry, I began painting. Thank God I'd been through Michael DeMeng's classes where I learned his layering techniques to achieve the most amazing painted surfaces. It was not easy to grasp how many layers go into a surface to achieve depth. And, might I add the patience one really needs to have. I do like the look, but often avoid it because I run out of patience. Well, fortunately, I happened to find an extra dosage bottle of art patience in my medicine cabinet. For this moon alone, I believe there are ~ 7 layers just for the main color. Then, there are many more layers in the eyes, lips, etc. The nice part about layers is if you don't like the look, paint over and start again. There are actually green, blue, purple, pink, and many other colors in there. The more I painted her, the more she felt like an Italian clown, part of the Pagliacci or even a marionette. I think my style is beginning to emerge. How lovely! I couldn't let the moon go up without a rich and colorful night sky behind her. While resting from a minor injury, I picked up my colored pencils. Had such great fun with them on the shrinky-dinks, but haven't found the look I want on paper. I really like a layered, depth, but didn't know how to create it. So, off I went in search of tutorials from the great world of bloggers. Not many, but I found one that showed putting red behind blue and blue behind red. Huh. It looked weird on it's own, but I figured it would be interesting to try in my favorite colors - pink and aqua. I started playing with the colors at hand. I was tickled to see the rich sky colors I could create. Just like so many nights I've tried to photograph, but my camera just won't pick-up. Oh glory me, this is really exciting. Now, I have a way to create night skies. I've been dreaming of this. And, all because I sculpted this moon, and just played really, do I know a new way to make a magical scene. LUCKY ME! Image Source: http://www.sewexpo.com/index.htm. Screen Shot of their great website! Thank you Sew Expo team for continuing to bring us GREAT content! 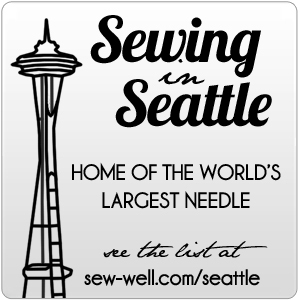 When deciding on which classes to take at Sew Expo this year, for those instructors with whom I had no knowledge or previous experience, I researched each instructor of interest online via websites, youtube, or blog posts others had written. I love knit clothing and have run into some snags, rippled seams, etc as I've sewn my own and the Craftsy class I took on "Sewing With Knits" taught me a couple things, but I needed better info from an experienced pattern designer or instructor who had worked with and fit knits for adult bodies. Voila! My desire was answered when I discovered Pamela Leggett, the talented woman behind Pamela's Patterns had seminars on Cool Cardigans and also Knits That Fit. She has a super helpful & well designed website. I was amazed, thrilled, and learned a great deal from two of her 1-hr seminars at Sew Expo followed by asking a couple specific questions at her booth. Ultimately, I walked away much more knowledgeable, clear on how to adjust problem areas I'd never known how to handle or identify (arm hole shortening for too low garment neckline), and several patterns I'd purchased that will give me beautifully fitting everyday basics that my wardrobe desperately needs. Yay! No more time wasted searching for or wearing ill fitting Ready To Wear (RTW). Pamela is the nicest person you could meet. Super helpful & elegantly dressed showing the many ways her patterns can be used. Her voice & persona are so cute, genuine, sweet and totally characteristic that I may be inspired to develop a puppet or character for an audio book after her (a compliment to be sure!). I'm currently working out the fit on my copy of Pamela's Pattern #104, The Perfect T-shirt. In a future post, I'll include the multitude of mods based on my conversations with Pamela and comparisons with my own RTW and other shirt's I've made. This is the 2nd step in the process (after taking photos of my RTW fits) toward getting a great fitting T-shirt. Yay! I'm on my way!